Averrhoa carambola is a species of woody plant in the family Oxalidaceae; it has a number of common names including carambola and star fruit. Star fruit, also known as carambola, is the fruit of the tree called Averrhoa carambola, which is indigenous to various regions in Asia, including the Philippines, Malaysia, Indonesia, India, Sri Lanka and Bangladesh. This is a very well liked fruit all over the Southeast Asia, throughout the South Pacific and some regions of East Asia. Star fruit trees are grown in all tropical areas, which may not be the native of the star fruit, including the Caribbean, Latin America as well as the southern regions of the United States. Star fruit comes with typical creases that run down along its sides. Usually, there are five ridges, but the number may vary at times. When cut through the middle, the cross section of the fruit has resemblance to a star and, the star fruit gets its name for this particular characteristic. This fruit can be consumed after cooking or also be used to prepare preserves and relishes. Some people also extract the juice of the fruit and drink it. Star fruit is a small tree or shrub that grows 5–12 metres tall, with rose to red-purple flowers. The flowers are small and bell-shaped, with five petals that have whitish edges. The flowers are often produced year round under tropical conditions. As mentioned above, generally the fruit has five distinct longitudinal ridges. However, in unusual cases, the fruit may have as less as four or as many as eight ridges. The skin of the fruit is very thin, even and waxy. When ripe, the color of the fruit changes from pale yellow to deep yellow. The flesh of the fruit is semi-transparent and its hue may vary from yellowish to yellow. Each fruit may enclose about 10 to 12 seeds that are flat and have a light brown hue. Each seed measures anything between 0.25 inch and 0.5 inch (0.64 cm to 1.27 cm) wide and is contained in a jellylike aril. The seeds lose their viability in just a few days after they are removed from the fruit. 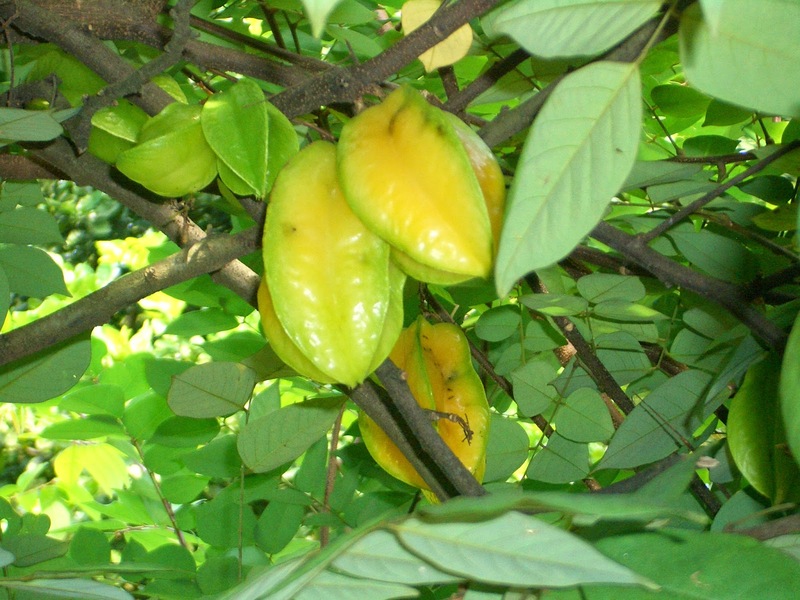 Star fruit is a close relative to another fruit called bilimbi. Similar to bilimbi, there are two varieties of star fruit. While the smaller variety is sour (or tastes like tart), the larger variety has a sweet flavour. It has been found that compared to the sweet star fruit, the sour variety of the fruit contains a higher level of oxalic acid. In recent times, botanists have developed some cultivars of star fruit. On the other hand, a number of sour star fruit varieties may turn sweet on ripening. The star fruit is native to tropical and sub-tropical regions and it is possible to cultivate this species at an altitude of about 4,000 feet (1,200 meters). This plant has a preference for full sunlight and adequate humidity. It needs about 70 inches or even more rainfall throughout the year. Although star fruit does not have any preference for specific soil types, star fruit needs soils having excellent drainage. This plant is troubled by several different pests, including ants, fruit moths, fruit flies and birds. Moreover, the crops of star fruit are also prone to damage by frost, especially in places like the United States. The tree is cultivated in tropical and semitropical regions for its edible fruits and for medicinal uses. Star fruit contains a number of nutrients, including antioxidants, vitamin C and potassium. At the same time, the sugar, acid and sodium content of the fruit is very low. Star fruit is also a potent and natural resource of primary as well as secondary polyphenolic antioxidants. It has been established that star fruit possesses antioxidant as well as antimicrobial properties. An extract of this fruit can be used to scavenge nitric oxide (NO), but this is entirely subject to the concentration of the extract as well as the maturity of the fruits. It has been found that the fruit extract has antimicrobial activity against Klebsiella spp., E. coli, Pseudomonas aeruginosa and Staphylococcus aureus. Apart from containing a number of essential nutrients, the calorie content of star fruit is very low. A serving of 100 grams of star fruit supplies us with only 31 calories, which is extremely low compared to any other favourite tropical fruit. On the other hand, the number of nutrients enclosed by this fruit is quite impressive. In addition, star fruit also contains antioxidants and a number of vitamins necessary for our well-being. Star fruit as well as its waxy peel offer us enough dietary fiber, which works to put off the assimilation of LDL cholesterol (also known as bad cholesterol) taken through ingested foods in the alimentary canal. In addition, dietary fiber is also useful in protecting the mucous membranes that form the lining of the colon from being exposed to toxins. Dietary fiber attaches itself to the carcinogenic chemicals present in the colon. Chemical analysis of star fruit has revealed that the fruit encloses excellent amounts of vitamin C - a very potent antioxidant. Generally speaking, consuming fruits that have high vitamin C content helps our body to develop resistance against contagious germs as well as forage the harmful and inflammation causing free radicals in our body. Star fruit contains rich amounts of flavonoids, antioxidant phyto-nutrient polyphenolic flavonoids. Epicatechin, quercetin and gallic acid are among the few vital flavonoids. Every 100 grams of the fruit contains as much as 143 mg polyphenols, which aid in protecting us from the harmful effects of oxygen released by free radicals - a process known as oxidation. Polyphenols work to get rid of the free radicals from our body. 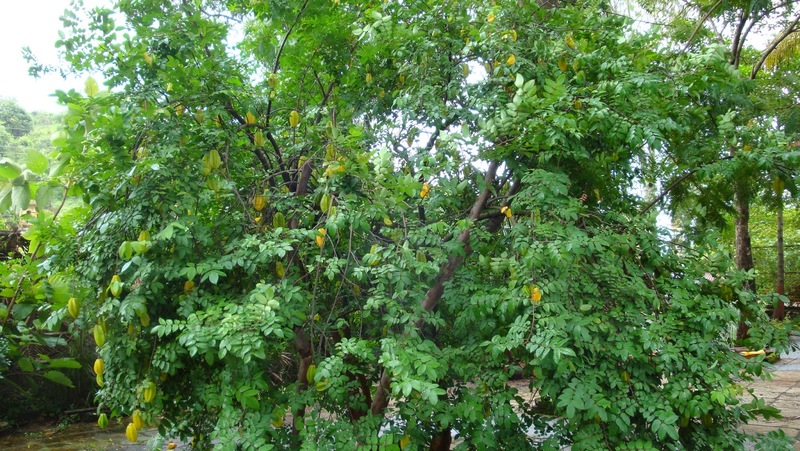 In Brazilian folk medicine, star fruit as well as the juice extracted from it are used in the form of a diuretic, expectorant and also to suppress cough. It has been found that consuming star fruit may help to bring down the levels of blood cholesterol and, at the same time, helps to add moisture and bulk to feces, thereby improving bowel movement. A decoction prepared from the leaves and roots of star fruit either separately or together may be useful in relieving headaches, curing chickenpox and getting rid of ringworm. In addition, it has been found that star fruit is useful for treating hangovers as well as prickly heat. The pickled star fruit is said to be more effective for curing hangovers. Some people have also used star fruit for treating sore eyes. In addition, nursing mothers are advised to consume star fruit, as it is believed to augment breast milk production. As several plants of the family Oxalidaceae, its fruits are rich in oxalic acid, which is toxic in high concentrations. There have been reports of intoxication in dialysis and uremic patients caused by a neurotoxin called caramboxine present in the fruit. Such toxin is normally filtered by the kidneys, but patients in dialysis or suffering from kidney deficiencies may show severe symptoms, in a few cases fatal, after drinking the fruit juice.